Thanks, Dad…I just love to make long, braised meals in 96-degree heat. But I’m not one to deny my fave octogenarian anything. Within reason, of course. So I thought rather than heat up the kitchen, I’d pull out the Instant Pot. Then Pat stepped in and wanted to make Swiss Steak with Mushrooms. What? Mushrooms? So I did some checking. It turns out Swiss Steak gets its name from the method of flouring, pounding and browning the meat. So technically, this is a “Swiss Steak” just not the traditional Old Fashioned Swiss Steak I grew up on. (Oh the sacrilege.) A lot of people, it seems, call this gorgeous beef done in a luscious mushroom gravy “Smothered Steak” which is how I’ve always known it. So call it what you will, Smothered Steak or Swiss Steak, just be sure to call me to the table if you make it! But anyway, the folks loved Swiss Steak with Mushroom Gravy Instant Pot Version. So much they each had seconds and as we sat around chatting after dinner, they kept cutting small pieces off the platter (it is spoon tender) and continued eating. Long after we were all stuffed. We all agreed, Swiss Steak with Mushroom Gravy Instant Pot is one recipe we’ll be making over and over again. Yep, I was won over. Thanks Pat for stepping in and suggesting mushrooms! And of course, we served our Swiss Steak with Mushroom Gravy with mashed potatoes. I mean, really, how could we not with all of that beautiful brown gravy? Being from Iowa, even though it’s a state with a lot of German heritage (which might make you think a lot of noodles and dumplings might be served) I do have a deep and abiding love of meat and potatoes. I do think the Swiss Steak would actually go pretty well with egg noodles, too, if that’s your preference. While a commercial “cube” steak can be used for this recipe, the results are by using the method of flouring and pounding out your steak (you’ll want to use a round steak for this, or a round roast sliced against the grain into steaks. You can see photos of how this is done on my post for German Beef Rouladen with Mushroom Gravy. This gives you the hallmark texture of a Swiss Steak. It’s literally spooned tender. One of the things I love about the Instant Pot (and I could go on – oh Instant Pot, how do I love thee?) is that it can so easily, with so little effort, take a cheaper, tough cut of meat and cook it till it’s fork tender. That saves you money right there especially if you don’t want to heat up the oven or wait hours for a slow cooker. Do watch for specials on beef for recipes like Swiss Steak with Mushroom Gravy Instant Pot Version – the round steak is traditionally the best cut for Swissing and you’ll want to pound the heck out of it. The advantage is that round steak can be very inexpensive. I often buy it in a “roast” form and cut it into slices rather than buy round “steak” which can cost more per pound. See details on pounding in my post for German Beef Rouladen. It’s very important in an Instant Pot to make sure all the residue or “fond” from cooking is scraped off the bottom or you may get the dreaded “burn” notice. That stops your Instant Pot, and unfortunately it doesn’t give any indication of how much time has elapsed when the IP is stopped. You’ll need to remove the food, clear any residue of the bottom and return the food and restart the Instant Pot. And this time you’ll need to guess how long to cook it. So be careful if you want to avoid that burn notice. It is also a bit difficult to regulate the saute function. Don’t let your browned bits burn during the saute process. If needed by, stop, deglaze and continue on. I put a note in the recipe. 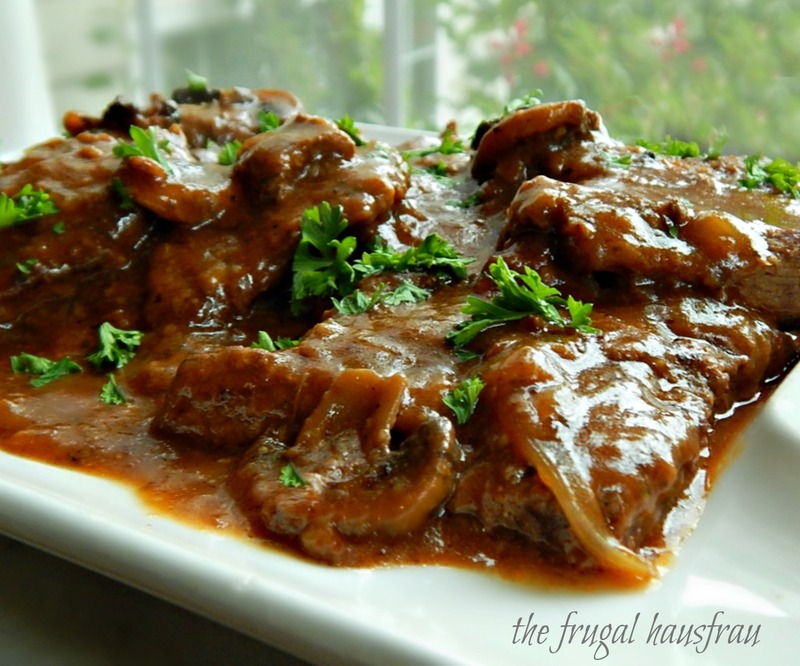 A classic Smothered Steak with Mushroom Gravy. You’ll need mashed potatoes with this recipe. Mix together flour, seasoning salt, salt, and pepper on large plate and set aside. Cut round steak into serving pieces. Dredge steak in flour mixture (really press in well), then use the edge of a sturdy plate to pound the meat. Repeat this pounding process on both sides until the steak is about 1/2 inch thick and noticeably more tender. Sprinkle on a bit more flour if the beef becomes sticky and the coating of flour disappears. A meat mallet may be used to pound, instead, the large pointed side. Add the mushrooms, onions, and wine and cook for several minutes, scraping up the fond on the bottom, until the wine has nearly evaporated. Add the broth, tomato paste, Dijon, salt, pepper, thyme and two tablespoons of the parsley & gently whisk to mix together. Nestle the meat back into the Instant Pot, along with any juices, turning and covering as needed so as much meat as possible is submerged and all has some sauce on top. Hit the Cancel button on the Instant Pot. Add lid and move valve to sealed position. Press the Meat function (35 minutes on medium pressure.) When the 35 minutes are up, allow the Instant Pot to go to the Warm function and leave for 10 minutes. Release any remaining pressure by turning the valve to the open setting. Remove meat to a platter. Set Instant Pot back to the Saute function, Normal setting. Mix the cornstarch with the tablespoon and a half of cold water. When the gravy comes to a boil in the Instant Pot, stir in the cornstarch mixture and continue to cook, stirring, for a minute or so until thickened. Using a large slotted spoon, remove some of the mushrooms and onions and place over the steak on the platter. Pour some of the gravy over the meat, sprinkle with parsley and serve the remaining gravy on the side. This may not be your experience but I find the temperature of the Instant Pot a little difficult to regulate while browning. After the second batch, the fond began to darken. If this happens to you, stop browning, remove the beef and add the onions, mushrooms, and Sherry, stirring up the fond, and cooking until Sherry is nearly gone. Dump into a bowl, add a little more oil and continue browning the beef. When steak is all browned, add the onion/mushroom mixture back in with the broth, tomato paste, Dijon, and seasonings and proceeded with the recipe. This entry was posted in Click here for Bargain Meals, Click here for Fabulous Food Posts and tagged Alcohol, Bargain Meal of the Week, Beef, Beef Stock, Instant Pot, mushrooms, Round Steak, sherry, Swiss Steak, Wine. Bookmark the permalink. Oh my! This recipe is fantastic! We had homegrown beef. The round steak we had swissed. Made exactly as posted and served with hot noodles and a big bowl of salads and hot from the oven Italian bread. Best supper ever. This is a keeper as I have lots of swisher steak in the freezer. Hi Fern, thanks so much for checking in and letting me know how much you liked it! You made my day! I think my 90 yr old Stepmom has as much fun as I do cooking with the Instant Pot, and this is really a family favorite! Yumyum!! Definitely making this today! 🙂 Thanks! And sorry to reply so late. Back in SD now, but home soon – the folks are moving into assisted living. So for the Swiss Steak – it’s gonna be a little different. I’d use a big oven proof skillet with a lid (or aluminum foil) and follow the recipe to where the meat is added back into the pan, and is turned and all covered with the sauce. The sauce should almost come up to the top of the steak, but not over. Bring to a simmer then cover, bake at 325 degrees F. for (educated guess) 1 1/2 hours or so.Maybe a little less, maybe a little more, until tender. Got it Mollie– slow bake til tender. It is so mouthwatering on the plate! Want to give it a try soon! And– what a big change for your parents! Did they initiate the move? Will they still be in SD? Are they looking forward to it? Are you the packer and mover? Hope and pray it’s a happy transition for all of you and they settle in and find good people there! xox friend! I was not happy they’re staying in Sioux Falls, but they’re going into a gorgeous place that was formerly a boarding school for the children of Episcopal Ministers and has been converted to a retirement community. It’s pretty amazing. They call it Prairie Gothic. Yumyum!! Definitely making this this weekend! Thanks! I am stopping by in case you missed me, Mollie. Hahaha! And to enjoy this delicious looking steak!! I am feeling hungry now! I always miss you, Jhuls lol!! I haven’t been able to get by to visit anyone much; been travelling back & forth to the folks and computer issues! Happy FF!! I have new staff issues – ugh! I hate teaching anything except about food!😂 Happy FF and stay safe! Yummy! This looks like real comfort food!!!! Thanks! It really is, and that gravy was so luscious! Hi and thanks for reblogging!! This looks so delicious, Mollie. I don’t have an Instant Pot but this recipe really makes me wish I did have one. Might have to investigate. It IS all about the gravy, lol!! Never made Swiss steak and I’m not sure I even have eaten it. Looks and sounds good. Promised myself I would not buy any more kitchen appliances and make do with what I have – thus no Instapot. Happy FF and happy weekend. I’m a little surprised, after all I think you’re included in the Midwest (although sometimes Michigan is and sometimes it isn’t? I can’t keep track) and I think this is a pretty down home meat & potatoes type of Midwestern meal. I promised myself the same thing, but am surprised at how much I DO like the Instant Pot – but then only time will tell. Sometimes there’s that infatuation phase and then something sits around for a decade or so, lol!! I didn’t buy an Instant Pot until I saw that my friends that were raving about it last Christmas were still raving about it. I finally gave in and bought one because we have purchased an RV and I thought it would be great to have in it for cooking on hot days. I think I’ll have to buy a second one because this one is staying in the house!! I don’t use it every day but I probably use it at least once a week. Not only does it cook things wonderfully, it reheats wonderfully. I bought some stackable stainless steel insert pans so that I can cook/reheat two different things at the same time. It reheats foods more evenly than in the microwave, doesn’t dry out or change the texture, and although it takes time for the IP to come up to temperature I think it’s worth it for the end results. No stopping to stir every 2 minutes to move around the hot spots. Hi Shannon! I don’t have the inserts, yet! It’s on my plan of things to look for online after Thanksgiving! I haven’t used my Instant Pot for reheating but I can imagine how good it works. When I made the Instant Pot Gyros I steamed the pita in the IP and it tasted just like it came from a restaurant. This dish makes me so hungry and it’s past 10pm here so I can’t eat until tomorrow 🙁 Looks really yummy! Yes, you absolutely could, and I thought about putting down basic instructions for those who maybe haven’t been cooking as long as we have (or maybe I should speak for myself) but didn’t want to until I tried it. I’m guessing a bit more liquid might be in order. I’ve never made Swiss Steak in my life. It wasn’t something my mom ever made and I only learned of it as I grew older and talked to my Canadian school or work mates. But I love that picture of the dark mushroom gravy over the mashed potatoes … a picture IS worth a thousand words. Thanks so much! I grew up with the “other” Swiss steak with the peppers, and I’m sure part of that was I grew up in a small farming town. 🙂 Meat & Potatoes, right! Jess, this is one of those meals that makes me want to lick my plate, When no one is looking, that is! !